Looking for a premium quality grass seed for your new lawn project around the Vancouver, Lowermainland? 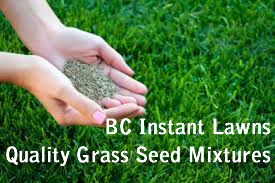 BC Instant Lawns offers custom packaged lawn seeding packages in Vancouver and throughout the Lowermainland. Use the form below to get a quote for your selected variety of grass seed. We sell the same varieties of seed that we carry in sod and we package them only with the amount of grass seed you need to complete your project. You can also add: Turf blend soil, fertilizer and overseed to your order if you wish. All packages are delivered to you within a week and come with full installation and maintenance instructions, so you can grow a fabulous looking lawn. Looking to plant your own lawn and grow it from seed? What is better sod or seed? BC Instant Lawns offers premium quality grass seed for sale, delivered to you. We custom packaged orders based on your area that you need to seed. Growing you own lawn can give you all the benefits of planting sod without the additional costs and at the end of the day you can appreciate your new lawn that much more, because you grew it. Keep in mind, the preparation for a seed bed and materials used to prepare for a new lawn from sod or seed are the same. You will still need a new soil base, fertilizer and water. The primary difference between seed and sod is the amount of work required to establish the lawn. To establish the sod you only need to make sure the lawn gets watered a couple times a day for a couple weeks and the chances of getting a weed infestation in already germinated sod is less likely than with seed. Seeding a new lawn will require special attention to watering / misting for a few weeks until the germinated seed establish a roots system. Weeds in seeded lawns are inevitable regardless of where your soil came from or your seed was produced. All seed mixture will contain some weeds. Sod will be treated at the farm for weeds already. We offer all the same seed mixtures that are used to produce our turf grass. Our grass seed specialty mixtures are used for shadded areas, high traffic zones, chafer beetle infested neighbourhoods, drought tolerant areas, sport applications and regular residential lawn use. Use the form above to get a quote and order your new lawn grass seed mixture today.